A second WoW account is one of the best investments you can make to streamline your gold-making operation. Once you hit a certain number of auctions this will save you a ton of time as you can repost and collect mailboxes on one account while you are playing the game on the other. I pay for both of my accounts using tokens and find that I have no trouble keeping up. With the RAF rewards you have no risk as the first two months are effectively free. In this post I will help you through the setup process to get two separate WoW instances with separate settings and some tips about what sort of hardware you might want to realize the full benefits. 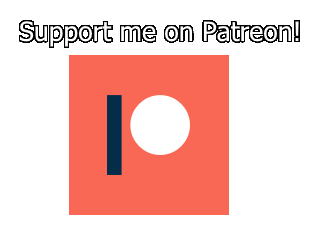 Disclosure: The links to hardware in this post are affiliate links, meaning I will get a commission if you decide to buy a product through them, this comes at no cost to you. WoW does not have very stringent hardware requirements and as such most gaming computers should easily be able to run two instances of WoW. My system can easily handle two instances of WoW as well as streaming and other applications running at the same time with no hiccups. The most useful pieces of equipment by far is an SSD hard drive that can fit your WoW installation and a second monitor. I just bought an SSD and it has DRASTICALLY decreased my load times. I’ve had the second monitor for a while and I would never go back. Below is the setup of my computer, if you want to compare it with what you are running. This works very well for me, and if you are planning to upgrade an older one or want to buy a new one this will give you mid to high end performance. Monitors: I have some older low end monitors. For WoW monitor performance will not matter although 144 Hertz might be good for some other games. A good cheap choice is this one, but if you want to 144 hertz you might want to buy something like this. Obviously we want to buy our second account as cheaply as possible. Using the Recruit a friend feature you will get a discount on the battle chest and you can buy the game for about 10 dollars or one WoW Token. The other advantage of the RAF service is that if you pay for one month on the new account you will get one for free on your main account. This means that the first two months of your second account are free. If you pay a third mount you will get one of the awesome RAF mounts as well. The first thing you want to do is to send a recruit a friend invite to one of your e-mail addresses. 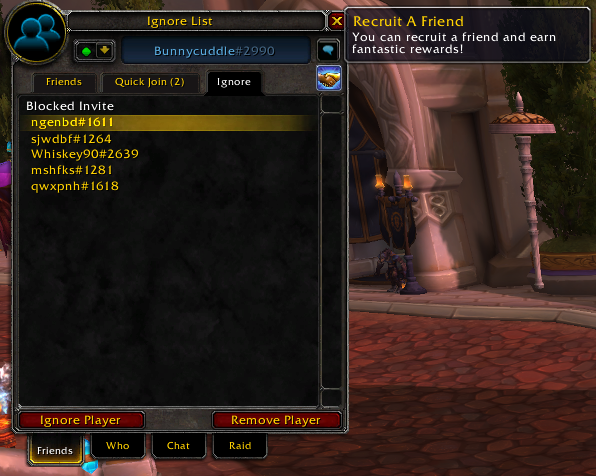 You can recruit a friend from the in-game social tab (default hotkey: “o”) in the top right. It’s the handshake icon. When you click it the following window will open. Enter the e-mail you want to use to create a starter account. You can use the e-mail of your current battle.net account and it will still be delivered. Follow the link in the e-mail and use click the I have a blizzard account to register a starting account to your battle.net account. You will usually get the discount offer to buy World of Warcraft cheaper in your e-mail within a day. When you use a secondary account you will usually want to have separate settings. I have my second WoW account in a much smaller window so I can use my second monitor both for WoW and browsing etc. You can’t do this with just one WoW installation sadly. Two full installations would use up an inordinate amount of hard drive space. Luckily there’s another option. By taking advantage of symbolic linking we can have to separate WoW folders, but they share all the game data. For a general lowdown on symbolic linking and how it works you can check out this link, but I will be giving you the necessary instructions to do it for WoW. When we use symbolic linking we want to share the following folders: Data, Utils and Interface. 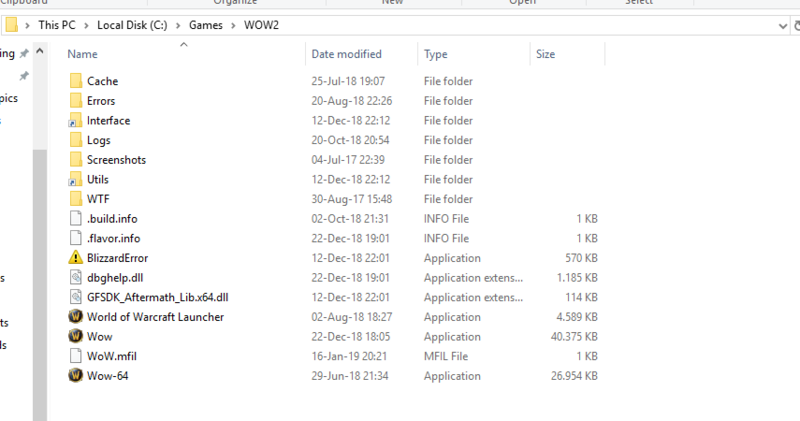 The first thing you do is setup the folder where you want your second version of WoW. Name it something simple as you will have to use it. First we set up the symbolic links. For this you need the path of your main wow directory and your new wow directory. My main installation is in C:\Program Files (x86)\World of Warcraft and my secondary one will be in c:\Games\WOW2. To set up the symbolic links we need to open the command line prompt as an administrator. Just open the start menu and search for cmd, then right click the command prompt and click run as administrator. Obviously you will have to swap out the directory paths for whichever you decide to use. In addition to these you need to set up a symbolic link that ensures that TSM actually backs up your settings for both accounts. The TSM settings you want to keep a backup of are located in the WTF folder. The exact path is going to be: World of Warcraft\WTF\Account\AccountName\SavedVariables. The symlink command will mirror your savedvariables from your second installation to your main installations savedvariables folder. This is where TSM backs up your data. To make sure that it works you need to put it in a folder with a different accountname than your main account. Make sure you replace “AccountName” and the actual WoW file paths. “AccountName” should be the account name for the account you use on your second account. The folder will be made for you already as long as you’ve logged in, so you can just head to WTF\Account\ to find it. For the accountname part of the string for your main account you can call it whatever you want as long as it is not the same name as your main account. Now we need to copy the rest of the files. Firs we copy the executables and dll files that are selected in the screenshot below. After that just doubleclick the wow executable. You will get a prompt to choose your Region. Pick the right one then WoW will launch and it will create the rest of the needed folders. Now you want to add a shortcut to this wow executable somewhere convenient. Using this you can open a separate instance of WoW and any settings will not be overwriting your main settings. The only inconvenience is that you have to log in using a password every time, but that is something you will have to live with if you want a second account with different settings. 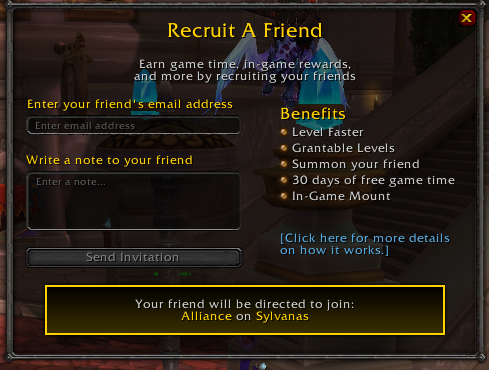 It is less of a hassle than doing separate settings each time you launch WoW. With this setup you will have to do a bit of work when a new patch is released. You will have to copy all the files in the base WoW folder over from your main installation to your symlinked second folder. It’s the files that are selected in the screenshot below. If you need some help or you have some way to improve the guide please let me know in the comments. Hopefully you managed to follow along and set it up! What would you recommend doing on an alt other than sniping while playing on your main (if there is anything else to do)? Is there any way to sync TSM groups/data/prices using symlinks as well? Or do you just run independent groups? i run independent groups. Having it synced is a bit too risky for me. If you are running two accounts with my setup you need to setup one more symlink top get TSM to keep back ups of both of your settings, which is really important in case you lose your data. You want to sync the SavedVariables account from your second Wow installation to the normal wow installation so the TSM app can detect changes to your settings and take a backup. So if you don’t link them, you run two instances of the TSM desktop app? That might be possible, I havent tried it personally, the only way Im sure works is to link the folders. This is much easier to just run a second PC. There maybe an easy or obvious answer to this, however not being an expert in using the command prompt I thought that I would ask the question. If you can point me in the right direction then that would be great. It is usually caused by some shenanigans in the file structure, make sure all of the folders exist except the one you are trying to link. E.g. 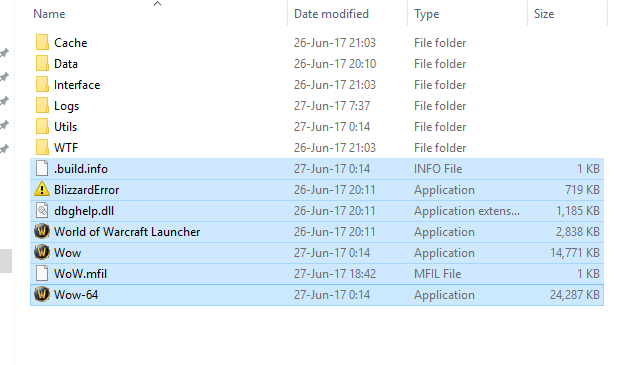 there should not be a SavedVariables folder in your WoW 2 folder structure. All the other folders need to exist though. I found some other possible solutions at this link, but without access to your computer I can’t dive deep into what might be causing the problem. I learned Symbolic Linking by googling around myself. I’m quite sure you have the SavedVariables folder in your WoW2-folder. I had the same problem and renamed the old WoW2-folders that I wanted to change to a symbolic link to e.g. “_SavedVariables”. Just to be sure to have a backup if something failed. Hello, trying to follow your instructions for linking the TSM data. My query is which account names should be used. I am assuming that it should both be the account being used on the secondary install. So what is happening is that when you use your 2nd wow client, it saves the tsm data to the 2nd wow folder, which is then being linked to the 2nd account saved variables on your original wow install. Does that sound right? okay I think i get it. This set up, wouldn’t work if you still used tsm on your primary account would it? If i understand correctly, your primary installs saved variables are just being mirrored from your 2nd install. Wont this cause any issues with saving your settings on your primary game? Just realized I made a mistake here. It should be the account name for account #2 in both strings. This is so that your account #2 settings are mirrored to your main installation and backed up by the TSM desktop app. Idk if enough people would benefit from this for it to be worth your time (especially with BFA around the corner) but I could really use an updated TSM portion. I did a quick rewrite right now, let me know if it made it more clear, or if you still think it needs some work! Hi, is this updated for TSM4? Hey! This is an awesome guide, thanks for this. One quick question. With these settings the TSM desktop app updates on DBmarket are going to be available for both my accounts? 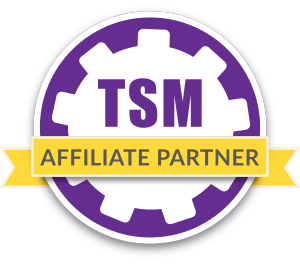 Yes, this setup will get you access to the TSM pricing data on both of your accounts. Hi! Tried to RAF myself with my already active account e-mail (Quote:”You can use the e-mail of your current battle.net account and it will still be delivered. Follow the link in the e-mail and use click the I have a blizzard account to register a starting account to your battle.net account.”) but it is just telling me that the game account is not eligable for this. Hi there! I had the same issue at first, but the RaF does still work after all. The trick is to first create a new WoW account and then use this new account with the RaF link. You can create a new account if you log in to your blizzard account on the website, go to the shop, select “World of Warcraft: Subscription”, and click “Subscribe Now”. On the page that opens (where you would usually enter your payment information) you should get a button “Create a New Account”. Click this to create an account, then cancel the subscription process. After that, you should be able to use the RaF link from your E-Mail and just select the second WoW account. Hello,i followed this guide a while ago,but now with the new folder setup its not working for me like it did anymore. Is ther an updated version or something? Last night there was an update from wow so i copied the build info folder etc….but if i log into my second accound now,everything is gone,i have too setup all my addons again my TSM setrtings are all gone erc and i dont know how too fix this. BTW i see that its updated already too the new folder setup,then i have too find out whats going wrong on my side.